This is a video blog that attempts to define excessive incentives using Memphis Business Journal press accounts, EDGE endorsed documentation and tools. Much of the excess is afforded by a lack of fiscal conservatism and a false corporate “trickle down” mantra with the promise of a better tomorrow for all. This excessive incentive policy environment has gone to stifle local small business and economic growth for all in Memphis/Shelby County. The output of the EDGE Board project estimator, used in the video, can be found below the video where it shows both the Mark Anthony and FedEx PILOTs were excessive based on a review of EDGE documentation and the EDGE Board standard found in the project estimator tool. 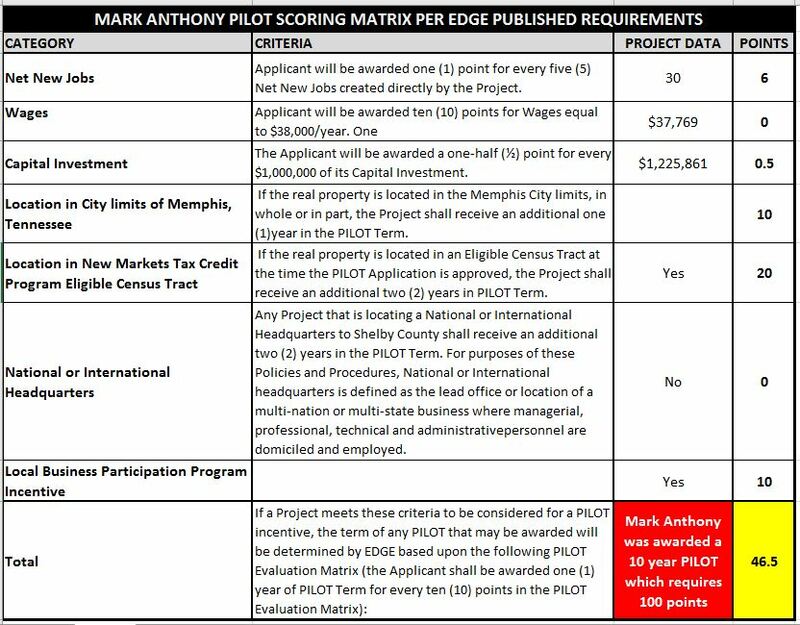 Additionally, not addressed in the video, was the lack of use of the “Tax Incentive Eligibility Analysis” tool by the EDGE Board, that would have only resulted in a 4 year PILOT for Mark Anthony as opposed to 10 years, saving taxpayers almost $1.4M. Responsible incentives like JNJ, Indigo Ag and Agilent help the entire business community and community as a whole. Excessive incentives, for the benefit of the small local few, erode the societal foundation on which commerce thrives making it more challenging to attract new industry to the Memphis area and for small business to thrive. MCCL Measured is designed to inform a quantitative conversation related to the effectiveness of public-private initiatives. Please send questions related to this blog or any findings by MCCL Measured to jkent@pathtrek.net .